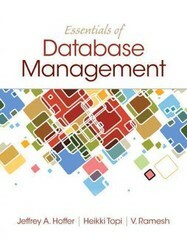 Essentials of Database Management 1 Edition Readers who want an up-to-date overview of database development and management. Focusing on the topics that leading database practitioners say are most important, Essentials of Database Management presents a concise overview designed to ensure practical success for database professionals. Built upon the strong foundation of Modern Database Management, currently in its eleventh edition, the new Essentials of Database Management is ideal for a less-detailed approach. Like its comprehensive counterpart, it guides readers into the future by presenting research that could reveal the “next big thing” in database management. And it features up-to-date coverage in the areas undergoing rapid change due to improved managerial practices, database design tools and methodologies, and database technology.